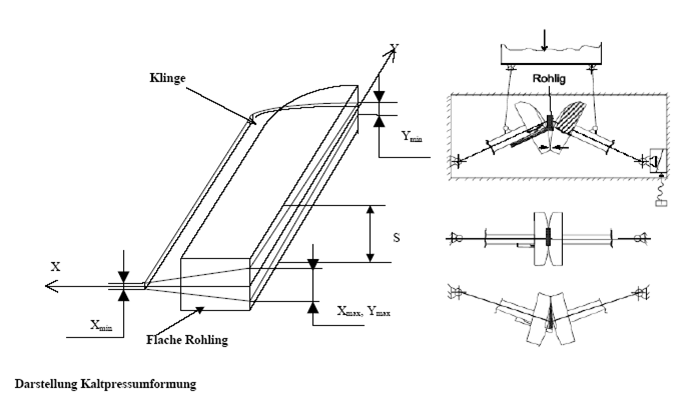 The method is based on using a rolling out movement to reduce the thickness of the billet towards the cutting edge. The core of the technology is that the final form is defined by the usage of special jacking systems. After the heat treatment there are almost no further grinding operations necessary. Thus there are no material losses. Altogether this new technology allows saving up to 50% of metall. The method uses commercially obtainable hydraulic presses. They can be integrated into the traditional production process without high additional investments.